Personally Experience the Amazing Phenomena that is Astral Travel! Important: Giovanni has taken all due care & safety mechanisms creating this program, however unstable people and/or people with a mental illness should not attempt to use this MP3. Astral travel is an advanced metaphysical concept outside the normal conscious realm and should only be practiced purposefully by stable persons. 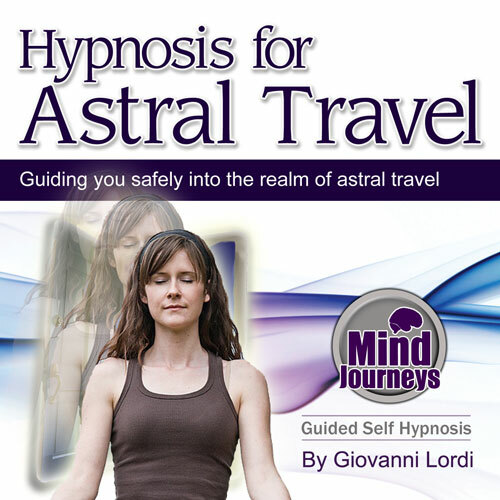 In this hypnosis session Giovanni will guide you down into the realm of astral travel (astral projection). His voice is accompanied by binaural beats in the Theta realm to entrain your brainwaves into the specific levels of consciousness where the astral realm lies. Our waking reality is created through conscious thought in the physical realm. Beyond our consciousness is the unconscious realm. This is where astral travel & out of body experiences happen, as our mind is only just consciously there, but our body (unconscious mind) is completely asleep. During astral travel your 'inner being' or 'spirit' leaves your physical body and is left to explore the depths of the unconscious parallel realms of reality/the universe. During astral travel you can observe & with practice, direct your experience in this alternative realm. Doing this with purpose can have incredible benefits in your day to day life. How Does this Session Work? Spoken hypnosis: Giovanni will guide you into the theta realm, giving you instructions & suggestions along the way. This is perfect for people who have have not purposefully tied astral travel before, as his voice gives you ways of heightening your own personal journey. Binaural beats: In the background are binaural beats attuned from a 7Hz level of theta to 4Hz theta. Binaural beat frequencies entrain your mind into exact levels of consciousness by manipulating your predominant brainwave resonance. The beats on this MP3s fall within the exact zones in which research through EEG machines has shown brainwave patterns to operate within during astral travel/OBE's. This level of consciousness is right on the cusp of deep sleep REM but where conscious thought is still just possible. Heartbeat: During astral travel your consciousness must still only just be there, but your body must be asleep. Your body connection is regulated by what is known as your unconscious mind. This is the same area responsible for autonomously controlling breathing, physical systems & recuperation. The constant heartbeat in the background of this recording is designed to entrain your unconscious mind by what is known as an isochronic frequency pattern. Doing this helps completely switch off your unconscious/body, whilst the binaural beats are entraining your conscious mind into the correct zone. The best time to listen to this program is when you just wake up of a morning and your consciousness is already close to the required level. It is still OK to use this MP3 of a night time or during the day when you have an hour spare. Simply play this MP3 through headphones at a level comfortable for you. Never try too to hard to focus on achieving astral travel, just try to flow with it. The trick is find that exact level that is right for you, and once you reach it you will know. Then it is a matter of keeping practicing with this program to develop more and more control over your direction when you enter the astral realms. "Calm, relaxed, floating, light, in control, everything is OK, easy to astral travel, enjoy astral travel, in a positive way, body completely relaxed, conscious mind awake, directing the journey, returning easily, safe, secure."